iboats.com has the largest selection of boat covers and PWC covers. Over 95,000 covers for 600 manufacturers. Quality covers by the industry-leading cover manufacturers. Industry-best warranties - Up to 10 years! Only the best-fitting custom & semi-custom covers. Trailerable & mooring covers available. The iboats.com - The best way to find the right cover for your boat! Welcome to iboats.com, the largest online retailer for boat and PWC covers. In fact, we have over 95,000 covers for almost 600 boat manufacturers spanning models from 1955 to present. Our quality covers are made-to-order for your boat in marine-grade fabrics such as canvas, polyester, and Sunbrella®. We offer a large selection of color options and fabrics to meet your needs, with covers for storage, mooring or trailering. Choose from our custom covers, which are patterned and tailored specific to your boat make and model, or our semi-custom covers that are crafted to fit your particular style of boat or PWC. Our affordable boat covers and low priced PWC covers provide exceptional protection from the elements with the stylish looks you're after. The most extensive collection of cover patterns & boat models found anywhere. Plus, we're adding 100's more each month. Our CoverFinder will quickly help guide you to the correct discount cover for your boat model. We've partnered with the leading cover manufacturers: Carver, Westland, Shoretex Fabric, Taylor Made, and Attwood to give you the industry's best warranties, quality craftsmanship and unbeatable performance in a cover built to last. 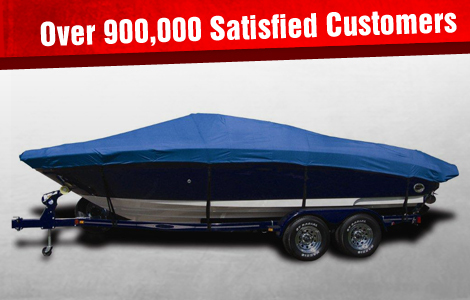 Thousands of boaters have become our loyal customers due to the undeniable quality and longevity of our covers. Our reputation has been built on honest, quality products from a family owned business. Buy with confidence at iboats.com. Our friendly customer service is available to answer any boat cover question you might have. We also offer a selection of quality accessories including tie-downs, support systems, vents, poles, reinforcement kits, storage bags, etc., to help extend the life of your cover, provide ease of use, and secure your trailerable cover. And, as always, iboats.com has fast, Free Shipping on all boat covers direct to you.